As a fruit, the apple symbolizes wealth, life, knowledge, and fertility. We think, it just tastes very good and has the makings of a star. 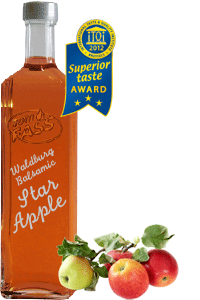 Our apple balsam vinegar is even more concentrated, even sweeter, even more harmonious in the taste, even more natural apple.